The Foodie Card offer – 10% off the bill in the café. 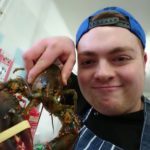 On the High Street in Pershore you’ll find the Deli@Pershore, an independent business providing high quality food and drink. Next door to the delicatessen is the Café where food is freshly prepared to order. Excellent coffees, teas and cold beverages are on offer too and the Deli also offers outside event catering. The Deli afternoon tea is made up of freshly made sandwiches, pork pies, sausage rolls and cakes, and is available until 22nd December. Take-way is also available. Cost: £12.95 per person. Upgrade with a Bailey’s hot chocolate or glass of Prosecco for £2 extra. Book: Call to pre-book 24 hours in advance on 01386 553689. Set in a beautiful building which was built in 1897, The Wood Norton is a high quality 50 room hotel with a restaurant which serves guests and visitors with quality food made from local produce. 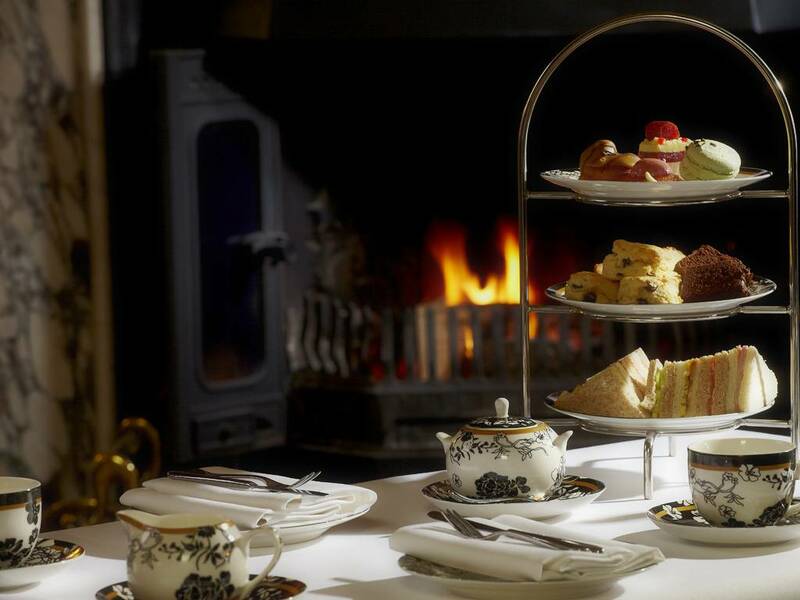 The Wood Norton are running a special offer in December on their festive afternoon teas. Indulge in savoury bites, freshly baked scones and all of the festive trimmings you could wish for. Your Festive Afternoon Tea will also include a homemade mulled wine for 2. This offer is available until 30th December*. Free soft drink with any lunch item Tues-Thurs / Prosecco upgrade with any picnic bench booked. Friar Street Kitchen aka FSK in Worcester has gone from strength to strength since opening in April 2017. The owners are from a farming and hospitality background and carefully select local suppliers to provide the best produce. Friar Street Kitchen’s festive picnic bench is fully loaded and very popular with locals and regulars, so you’ll need to get in quick! The festive bench includes a free range turkey, stuffing & cranberry burger, brie wedges, hand cut chips, cranberry dip, pigs in blankets, chocolate orange muffin, milk & cookies cheesecake smash, mince pie, snowball, candy cane and chocolate coins. All benches include a choice of soft drink. A vegetarian and gluten free version is also available. Cost: £16.95 per person. 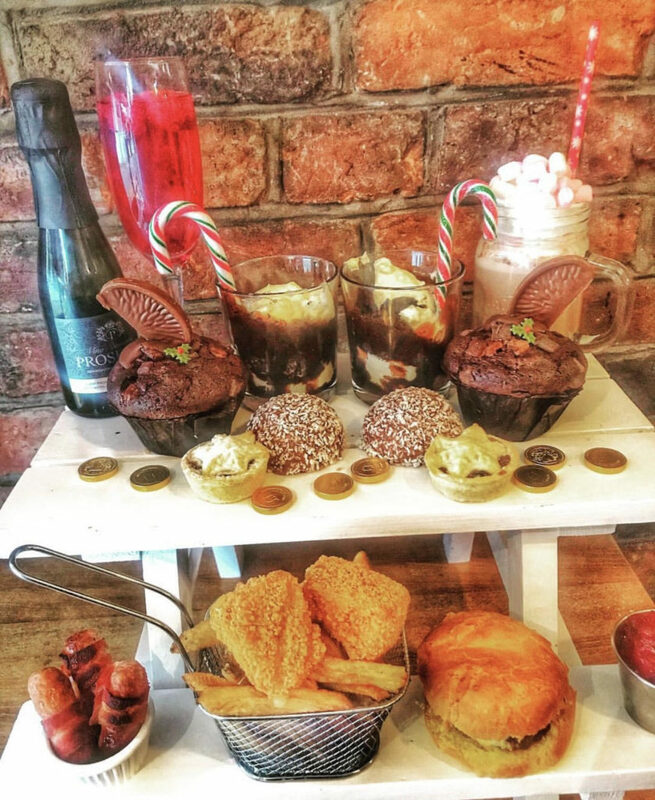 Upgrade to a Christmas cocktail or Prosecco for £3.50 / £6 per child (includes, mini burger & chips, drink and muffin). Book: Call 0190527770 or email info@friarstreetkitchen.co.uk. The festive picnic benches must be pre-booked in advance. Picnic benches are not available after 6pm on a Friday or Saturday evenings. The Foodie Card offer – 15% off any breakfast item (Available until midday Tues-Fri) / 10% off Afternoon Tea (for one person or two people) Tues-Fri. These vintage tea rooms on Friar Street in Worcester were established by a professional baker, and they serve breakfasts, lunches and of course, afternoon teas. Homemade cakes are on offer and the light bites/lunches include sandwiches, Ploughmans, soups and pancakes. There are 14 types of loose tea on offer, quality coffees, and for something stronger have a glass of Prosecco or the Gin Teapot Cocktails! 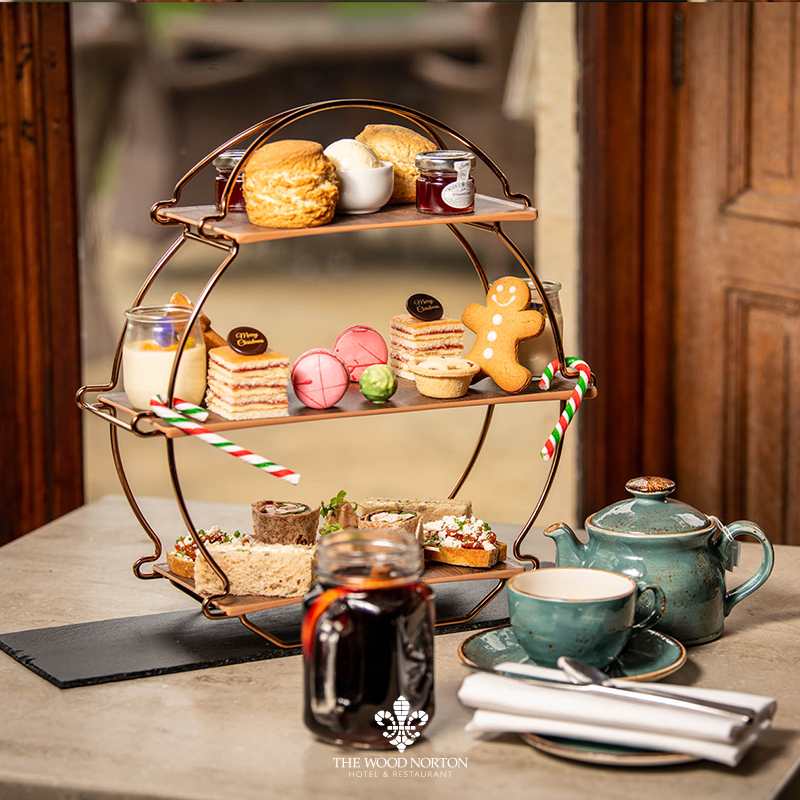 The festive afternoon tea includes a choice of finger sandwiches and sweet treats. Vegan and gluten free options are also available. 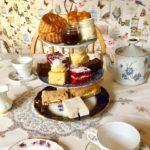 G&Tea can cater for afternoon tea parties for up to 25 people for a unique Christmas party or celebration. Cost: £20 per person. Includes a glass of Prosecco, local ale, Christmas mocktail or unlimited tea. The Foodie Card offer – 10% off al a carte menu Tues-Sun (max table of 6 people). The Orangery Restaurant and cocktail lounge is based On Ipsley Lane, near Redditch at The Old Rectory House Hotel. Book a festive afternoon tea and enjoy a selection of artisan rolls, orange-scented currant scones served with Cornish clotted cream, The Orangery’s very own orchard and damson jams and an assortment of tea cakes and pastries. Afternoon teas are served with a range of British teas and Union hand-roasted coffee. Cost: £19.95 per person. Upgrade to a 125ml glass of Belstar Prosecco or Rosé for £24.95 per person or 125ml glass of Nyetimber Cuvee or Rosé British Fizz for £29.95 per person. Book: Call 01527 523 000 or email book@the-orangery.com. Afternoon Tea must be booked a minimum of 24 hours in advance. 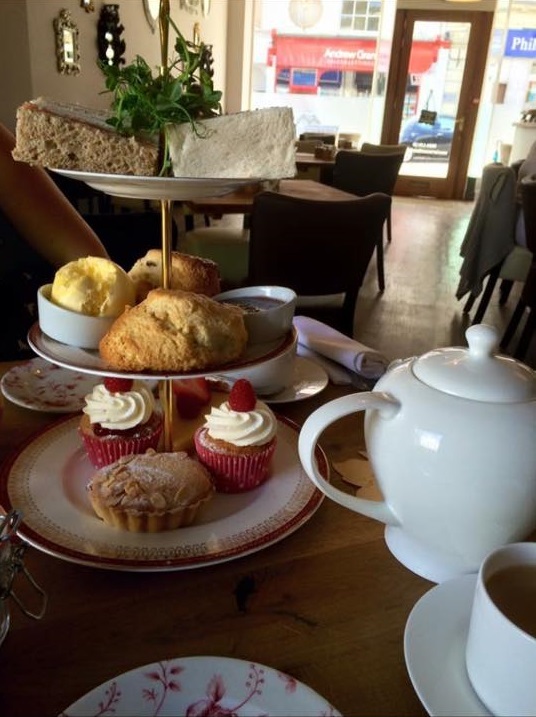 Afternoon teas are served Wednesday – Saturday 12pm – 4pm (last table booking from 2pm). This luxury hotel is set in the countryside just outside Kidderminster. Award-winning Brockencote Hall has 21 luxury bedrooms and the food is prepared using fresh ethically sourced ingredients from artisan producers. 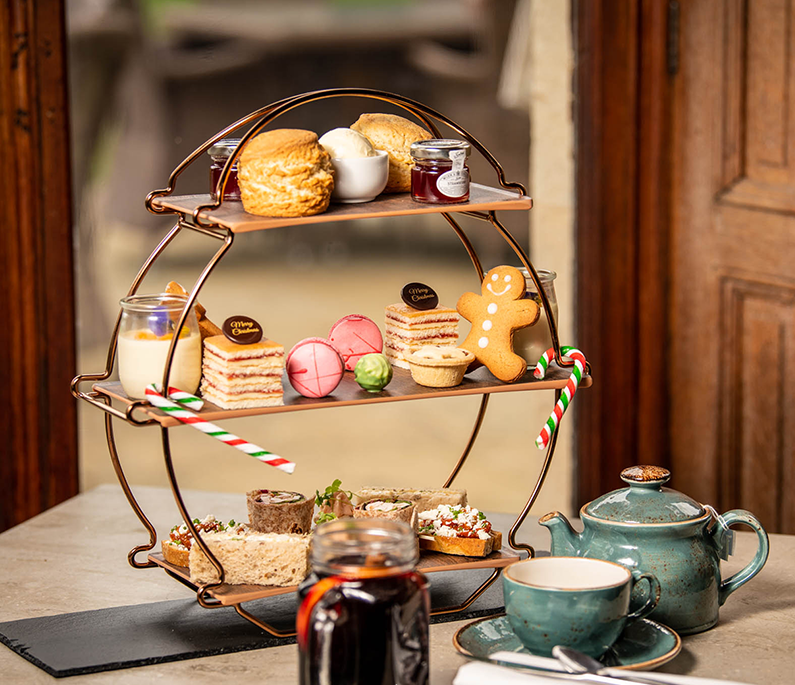 A festive afternoon tea at Brockencote Hall, Worcestershire, is a real treat after a busy day spent in a whirl of Christmas present shopping or to warm up after a frosty winter walk. Take a couple of hours out to just stop, relax and share an indulgent treat with a friend. 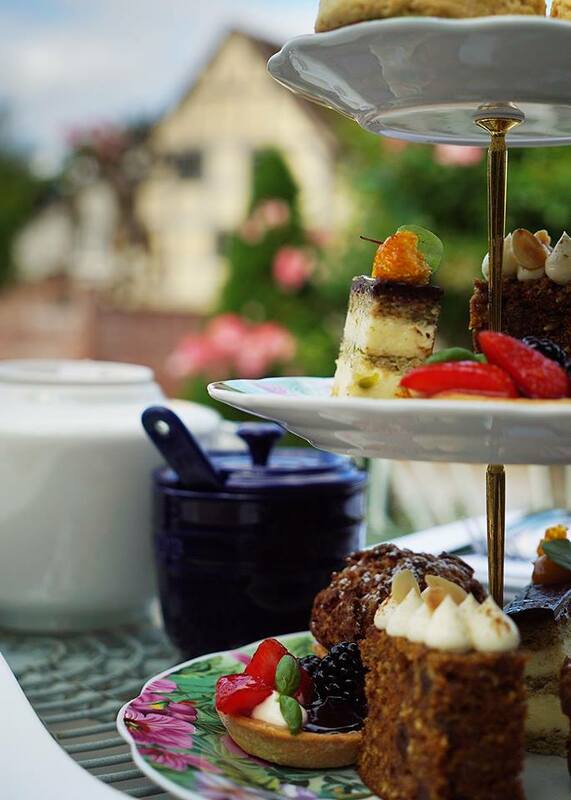 Brockencote’s cream teas and full afternoon teas are a homemade and beautifully presented selection of festive fancies, mince pies, sandwiches, cakes and scones. Why not add a glass of Champagne, mulled wine or Winter Pimm’s to really get you in the Christmas spirit. Book: Call 01562 777876. Not valid on 25th & 31st December. 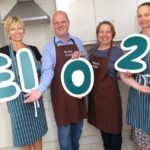 10% off cookery school classes. Award winning Eckington Manor offers high end accommodation, food and a cookery school at their beautiful country side location. Festive afternoon tea is served Thursday, Friday & Saturday afternoons throughout December until 4 pm, and includes a selection of finger sandwiches, homemade savoury and sweet cakes and pastries, and tea & coffee. Cost: £19 per person. Upgrade with a glass of Prosecco or Mulled wine for £6. 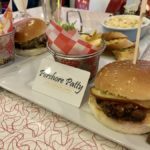 The Foodie Card offer – 15% off food & drink bill. Cafe Delicieux on Queens Street in Droitwich offer a great selection of teas, coffees and is a great place to stop for a bite to eat. You will find a delicious selection of sandwiches, pancakes, waffles, desserts and high tea. Soft drinks include milkshakes and juices – delicious! For a unique afternoon tea with a difference head over to Cafe Delicieux where you can choose between a traditional English or an Indian high tea. The cafe also hosts 5 course festive dessert tasting nights (limited spaces) in December. The Foodie Card offer – Free glass of fizz or a soft drink with every full cream tea booked. Holland House on Main Street in Cropthorne has three acres of beautiful gardens which lead down to the River Avon. There are 27 bedrooms at this retreat and hospitality in the form of breakfast, morning coffee, lunch, afternoon tea & cake and dinner. The warm cream teas come with freshly baked cakes, homemade scones, and unlimited hot tea. A vegan version is also available. The Foodie Card offer – 15% off food & drink bill Mon-Fri, between 12 -2.30pm (excludes Bank Holidays, Christmas day and new year’s day). This family run hotel on Belle Vue Terrace in Greater Malvern offers 17 rooms and a quality restaurant. There are a range of dishes on offer plus specials and a children’s menu and a Sunday carvery. The refurbished restaurant has 50 covers and there is a smaller dining room which seats up to 24 and is ideal for private parties. Festive afternoon tea is available Monday to Thursday 12 pm-2.30 pm and Friday to Saturday 12 pm-5 pm. Book: Call on 01684 561837. Please give 24 hours notice before booking a festive afternoon tea. The Foodie Card offer – 10% off lunch menu food bill (Mon-Sat) / 10% off Sunday brunch food bill / 20% off tasting menu food bill. 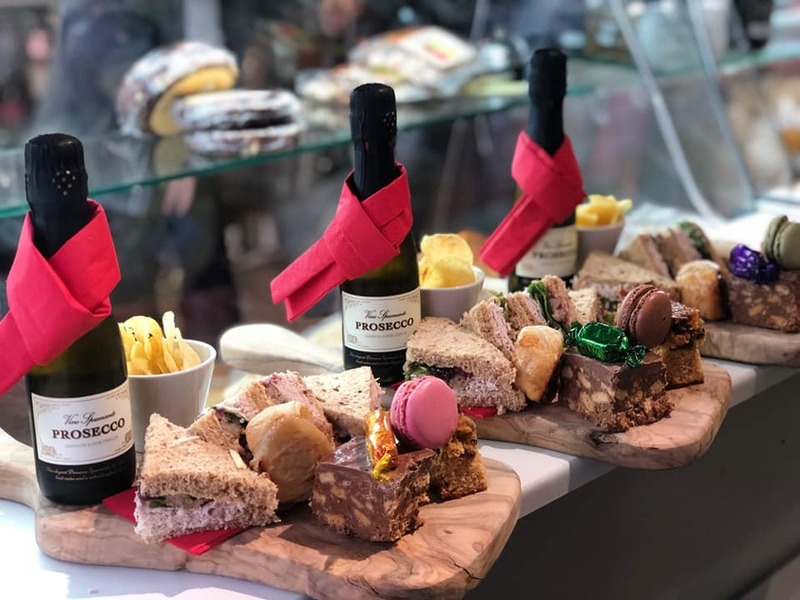 Terrace on the Hill is a high end café in Malvern serving quality food from brunch to lunch to afternoon tea to pre theatre meals. On special dates (always Saturdays) it is open in the evening and the fine dining 7 course tasting menu is served. 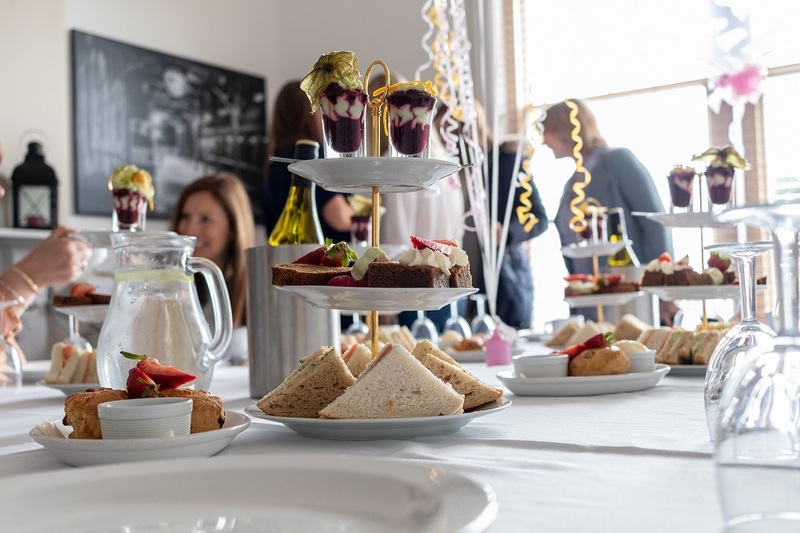 The festive high tea includes a fruit or plain scone with strawberry jam, clotted cream, finger sandwiches, seasonal tarts and cakes, with a choice of tea or coffee. 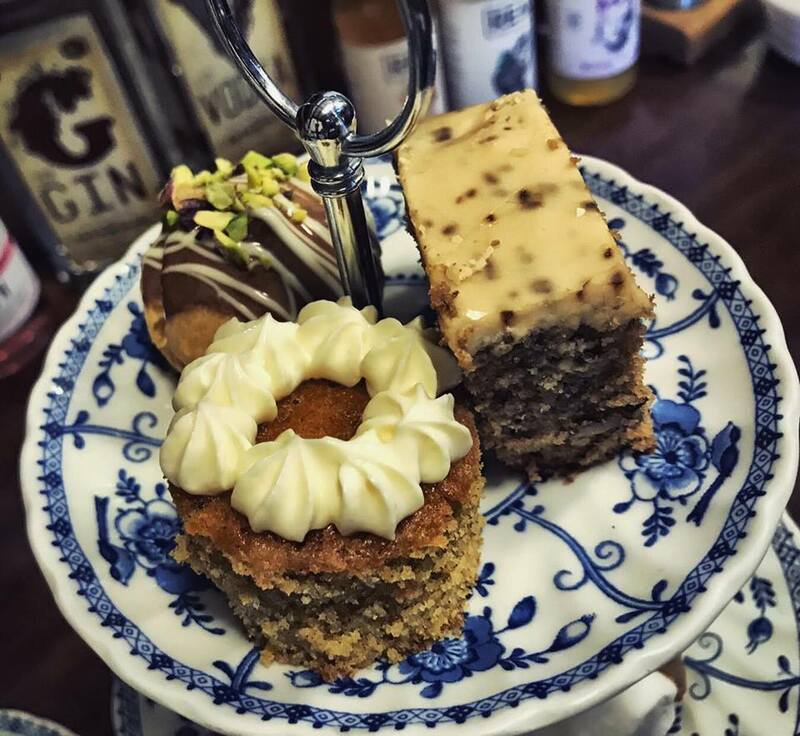 Apparently most of TotH’s customers often struggle to get through the whole high tea without taking some home…will you finish yours? 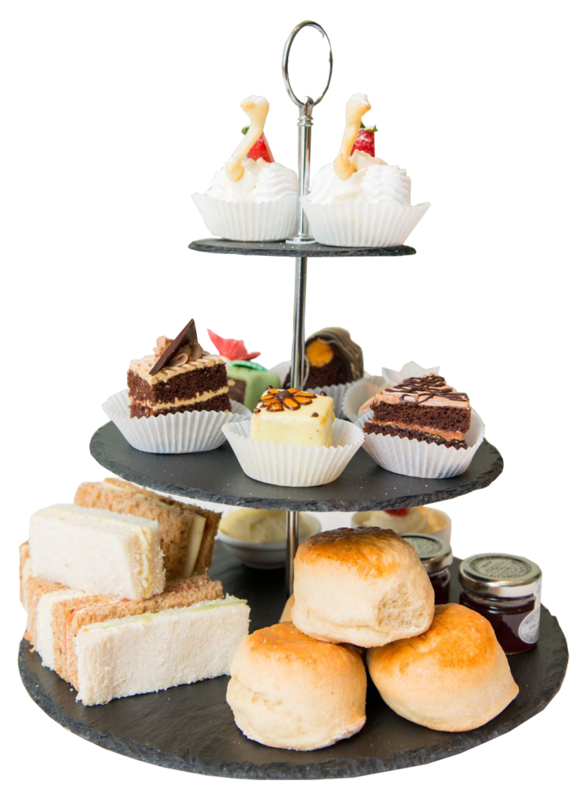 Cost: High tea £14.95 per person / upgrade to a decadent high tea (includes a glass of Prosecco) £19.95 per person. 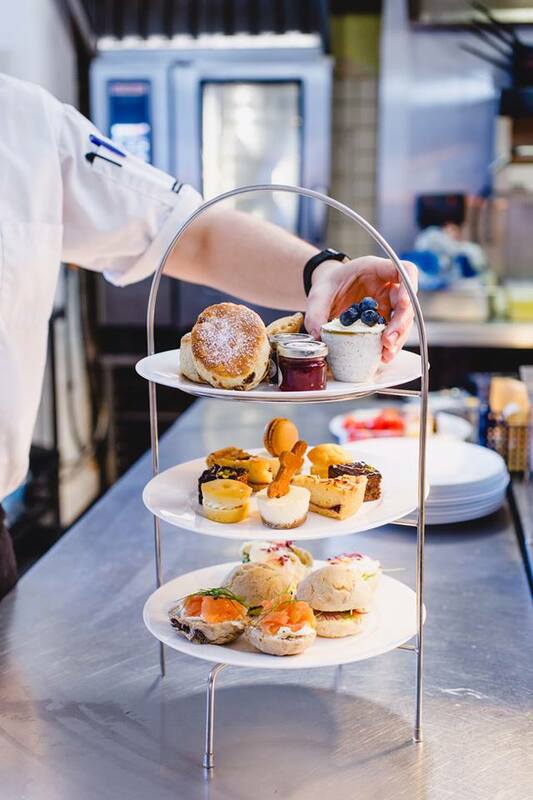 Other afternoon tea favourites include; The Lygon Arms, The Fish Hotel, Chocolate Deli, Jukes’ Tea Room, Stanbrook Abbey and Buckland Manor.